A controversial topic, especially in the Middle East where 96% of local families have domestic staff, is the role of the maid as surrogate nanny. Mostly untrained, maids in the UAE are often left with the important responsibility of child rearing in addition to house tasks like cleaning and ironing. Is this role unacceptable, necessary, of concern or entirely natural given the increasing number of mothers now working? 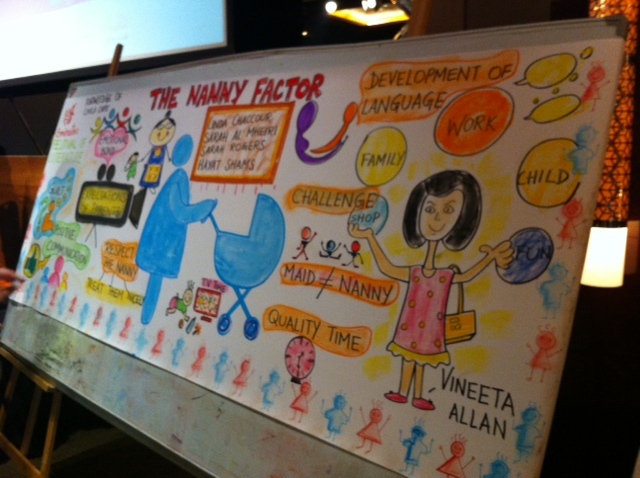 The panel, all working mothers, spoke from a range of personal experiences – from having had a nanny as a young child and continuing in the tradition now as mother to never having had a nanny and taking the choice to be at home with infant children. The moderator took the panel through the guilt factor and whether a mother can ever be happy – either as a working mum and wanting to be at home or a stay at home mum and wanting to be at work. Those with nannies often feel a paradoxical tug between the need for the nanny to have an emotional bond with their child but also don’t want to feel threatened by the nanny in their role as mother. A happy and fulfilled mother is the basis for a successful relationship between the nanny/maid, child and parent as it’s when the mother is accepting of the situation, trusts and respects the nanny and shares parenting values that the nanny factor becomes positive and constructive. It becomes more challenging where the nanny is put in a subservient role and expected to provide a parenting role, often resulting in confusion for all concerned, including the child. The panel agreed that consistent parenting requires open communication, not only to manage expectations but to ensure that the child benefits and is not able to play adults off against each other. Basic training in first aid should be standard as maids often come to the UAE with little child caring experience. Some parents hire only women of a certain age or are mothers themselves on the basis that nurturing can’t be taught. The underlying message regarding the pros and cons of hiring a nanny is that there is no one right answer – it is determined by the individual‘s circumstances. Mothers need to find the right life balance to fulfill their needs and provide quality time with their children on a consistent basis. An unhappy mother, whether at home or working, will not benefit anyone particularly their children.